Political economy is "the science which treats of the nature of wealth and the laws of its production and distribution." Human beings are not wealth: unless one treats them as commodities. We observe that people are sovereign beings by nature. The right of possession of one's own time and the produce of one's own exertion is a natural circumstance, proven by humanity's eternal striving for liberty. Qualities and skills of persons are not wealth, except in a metaphorical sense. Qualities and skills inhere in the individual, and the individual is not a commodity. Gifts of nature, including land, water, air, sunshine and the broadcast spectrum are not wealth. This is not to say these phenomena are not valuable, but it is to make a distinction between things made by human beings and thing not made by human beings. Accepting that by nature human beings are free and have a right to life, it necessarily follows that gifts of nature are a coequal birthright of all people. 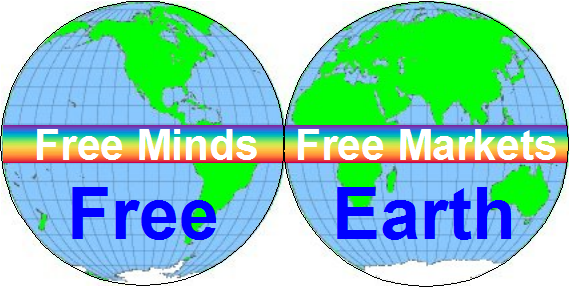 If some persons can have an exclusive claim to parts of the earth, then others can and will be denied equality in their nature as earthlings. To amplify: if one person must work for another simply to gain access to any portion of earth, then the two are not equal in their natural right to life as human beings. We assume this much in this science: all human beings are equally inhabitants of earth. What, then, is wealth? It is things made by human beings that someone, including its maker, would give up exertion for. Wealth is solidified exertion. Something that would not exist except it had been fashioned by a human being is wealth. To exist, wealth requires human effort be applied to gifts of nature. Capital: wealth used to make more wealth. So, we have defined the nature of wealth and indicated how it is produced, namely by Labor (most often using Capital) fashioning Land into a desirable form having an exchange value. What of the distribution of wealth? By distribution we mean what part of Wealth's value is attributable to each of the factors of production, Land, Labor and Capital. What part of Wealth is owning to Labor, to Land, to Capital? That part of Wealth attributable to Labor we term Wages. That part of Wealth attributable to Land we term Rent. Note: Rent is the differential in inherent (owing to quality or location) productivity of Land which equal amounts of Labor produces. That part of Wealth attributable to Capital we term Capital Return. Where Land has no relative value (no expressed advantage over other land) there is no Rent. Under such circumstance and where no Capital is employed, all Wealth goes as Wages. Where there is no Rent and Capital is employed, the Wealth produced beyond what Labor alone could produce (Wages) is Capital Return. Where Rent arises (owing to multiple interests in particular Land), Wages and Capital Return are determined out of the Wealth not first attributed to Land and distributed as Rent. The great question for humanity is, "Who should count Rent as revenue?" Land is a gift of nature. So long as transactions involve only Labor and Wealth (with no portion of Wealth distributable as Rent), the exchanges are of human energy. But where Rent is involved, the recipient of Rent is paid for a gift of nature while the payer is surrendering human energy itself or its embodied self, Wealth. We of the Henry George School argue that privatized Rent is the root of all degrees of involuntary poverty, and thus the ultimate cause of most social ills. While some live on gifts of nature and others compete with still others to pay Rent, Wages necessarily fall for the laborer. Unearned riches pile up for the Land owner while the laborer sinks Wages into speculative Rent. We advocate the community collection and use of Rent.